I'm sure most of you recognize this quilt, "Take It Out Back". It received an Honorable Mention ... as did "Imagine Monet". These two by Tone Haugen-Cogburn of Maryville, Tennessee were among my favorites in this show. Tone based this quilt on a photo taken by one of her daughters on their last trip visit to Norway. It represents her memory of home and the sea. Tone made this piece as part of her presentation for a Cities and Guild course. It's based on the concept of Pajagi, a Korean wrapping cloth. I believe the material she french seamed together is fabric traditionally used in Korea. This quilt by Joni Dunbar was entered from Switzerland. It is based on a mathematical fractal with no two foundation-pieced squares being the same. The 3 stages of the appliqued dandelion reflect the cyclical repetition of the fractal. Those design elements are reflected in the machine quilting. I think it's a wonderful and clever original design. Coming: Orange, Yellow, Red ..."
Melissa Carter of Knoxville, Tennessee made this quilt for the SMQ Guild Challenge, "Going Green" (the same for which I made the Smoky Mountain quilt). Her inspiration came from what she saw this fall in her own back yard. Melissa made this piece in the "Ortwork" workshop I taught last fall. It was her first foray into this technique and served as a study for her larger show piece. This dazzling quilt is the third quilt made by Celeste Lowndes of Apex, North Carolina. She and I have a special relationship through her mother-in-law, Gayle Lowndes, who was one of my best friends before she died of cancer a year ago. I'm pleased to see a ribbon attached to her quilt. Celeste was inspired by "Gayle's studio" and a picture of one of Scott Murkin 's strata quilts she saw in "American Quilter". 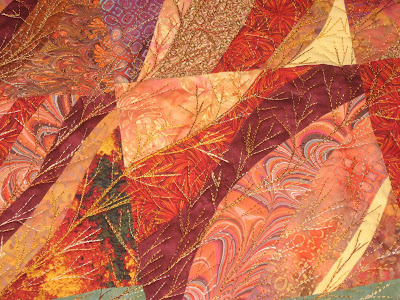 Look at the quality of her freemotion quilting on this piece. She definitely started out on a high level of design and skill. Sheila Rauen, one of our guild members, brought her machine to demonstrate the special techniques she's come up with for making her signature style quilts. This is one of her entries in the show. It received the special award, "Just For Fun", as well as an Honorable Mention ribbon. Sheila used a photo that she had taken at the bird bath in her yard. 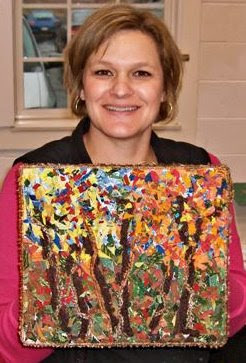 She added dogwood trees to the quilt to frame the scene and add color. Techniques include machine applique, fabric painting, free-motion embroidery and quilting. She stitched french knots for the dogwood centers. More photos that I took today will be posted and I'll take more when I go back to the show on Sunday. Thank you for sharing these wonderful quilts with us. There are some beauties there. We don't have any shows in Crete. So I am not going to be able to see this sort of thing in the real but I love looking at peoples blogs when they show photos of the quilt shows. Thanks for sharing. Thanks for this post, Nellie---i've just started verbalizing how i feel about what i do with textiles, and may not get ribbons or mentions for my work, but i do want in! Enjoyed the quilt show and congrats on your ribbons!